The following post contains content about suicide, suicidal thoughts and a suicide attempt. One time, not too long ago. Suicide was my constant companion. Suicidal thoughts consumed my mind and life. Suicidal ideations overwhelmed me almost to a point that you could call it an obsession. I could not get those dark morbid suicidal thoughts and even suicidal planning out of my head. Suicidal thoughts were at my darkest moments my only hope I had, as scary and sad as that sounds. It is gruesome and true. I tried endlessly to distract myself from thinking the way I did so many times before, but time and time again the thoughts came back, unannounced, unasked, uninvited, unwanted and unwelcome. Seemingly, my suicidal thoughts were not my own, but came from someone or something else. No matter where they came from they were a part of me, yelling at me inside my mind. Suicide was part of my name. Suicide is much more than seven letters combined together to form a word. 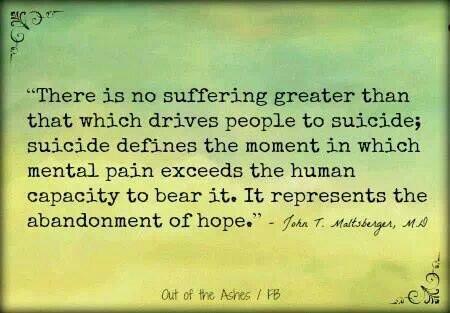 Suicide is more than a symptom. Suicide is more than a statistic. Suicide is real. Suicide is very painfully real. Because it is suicide prevention month I wanted to share this post I first wrote back in February 2018. I want to share more than facts and statistics. I want to share what suicide really is. In case you are unfamiliar with my story, I want to give you some background information before I share the following post I wrote on February 27, 2018, ten days after the morning I should have died. The day I had reached an elated mania. The day I had reached a psychotic state. The day I no longer fought my suicidal ideations. On this day I had no will to live. On this day I was gone. On this day I had NO HOPE. My brain lied to me and I felt happy and peaceful because I was finally going to meet Jesus. I was ready. So, I took over 120 Klonopin (Benzodiazepine), handfuls of the sleeping pill Ambien and a handful of Depakote (used to treat bipolar) and typed good-by letters on social media until I could not keep my eyes open any longer. I closed my eyes to fall asleep and never wake up again. I woke up to the loud explosions of policeman pounding on my bedroom window and then I fell hard and fast on my bedside table as I tried to stand up. This caused black bruises on my body and a large bump on my head. I remember nothing else. I have no memory whatsoever of the next four or five days of living. I was in a black out state caused from overdosing on Klonopin. I want to be a voice for suicide prevention and awareness. I want to educate others by sharing my story and give insight into the mind of a person that should have died by suicide and lived to tell her story. I have had numerous suicide attempts before over a 25 year period. My very first attempt was 20 years ago. My first and my last, and I mean last attempt, were the most serious, but this last attempt was the worst. I should have died, but God saved my life, again. This time it was significantly different than ever before. I had no fight in me. I was ready to die. I always fought my suicidal ideations in the past, but not this time. The voices told me I had no choice and it was time to die. I was at peace and ready to meet Jesus. I was happy. That is what is so scary. At the time, it was not scary because I was in psychosis. Replaying those lies in my mind and remembering the peace I felt is extremely scary and horrifies me. 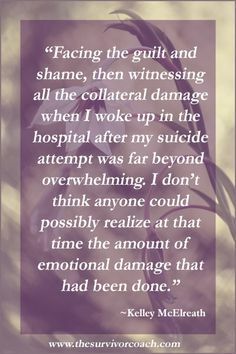 I had many warnings to get help, but because I was in a manic mixed state I refused to get help and was in denial. Bottom line, I was not in a good place and it was the scariest darkest moment I have ever reached. I want to share this part of my story, so I can help others. Today, I have no premonitions. I am unsure of my future, but I am fighting to have one. My mind is cloudy and overwhelmed from the aftermath of my recent and severe suicide attempt. After I arrived back home from the hospital yesterday, the sorrow, sadness and pain resurfaced, bringing back many of the same feelings I had on the day I took what I thought was a lethal overdose. Confusion and huge memory lapses became overwhelming. I lost ten days of my life and am unsure of the events of many days of my life. Having little to no memory of time or recollection of what happened in the body you were living in, is a scary and indescribable and confusing feeling. I lost days of my life and would like to know what occurred on those days of my life. I want to know what happened and will need my family to help me put the pieces back together. I know understanding what happened and what I did as I lived in a body that was mine, but I seemed to not be present in for many days of my life, will help me put the pieces of my life and myself back together. I need to know. I want to know, so I can put the pieces of my broken heart and broken life back together, one piece at a time. Carefully gluing my broken self back together one piece at time will strengthen and heal me. Applying an adhesive of strong bonds of love and support between each broken piece of myself, will help put me back together, heal me, hold me strongly back in place in a life I can live again. Prayerfully, I will never become unbroken again. Love and support from my amazing children is already beginning to repair my brokenness. Filling in the holes and gaps of what I did and how it happened will help strengthen me. Knowing and loving how God saved my life again and understanding why he continues to save me is puzzling and maybe something I will never understand. I know God loves me, saves me, and continues to heal me. God is with me now and He never left my side, holding my hand and catching each one of my tears and my children’s tears during my serious suicide attempt. What I am learning now is that it is going to take a lot of strength to repair what I have done, while I was away during my illness. I mean away in the physical sense and the mental sense, as I was not mentally fully present for many days, maybe weeks before, during and after my suicide attempt. The aftermath of my severe suicide attempt feels like a train wreck right now. It feels like I was hit by a train and now I have to clean up the big mess from the wreck I caused. I must face what happened and what I did. The worst part is that I unknowingly did not realize God would save my life again and I, for some reason, wanted to say good-by on social media. Putting my good byes on social media is in fact what saved my life, but is now making my train wreck seem bigger. Because I said good-by and acknowledged my suicide attempt on social media, everyone knows and I feel embarrassed, ashamed and afraid to go back out in my community and face what I did. Because there is stigma related to suicide, my fear of the stigma related to my suicide attempt is huge. I may be stigmatizing my own self in a way because of my fear of the stigma. I feel like I have to “come out of the closet” and face the stigma related to suicide. I know the stigma is there, so my fear of the stigma is making the process more difficult for me. Unlike other severe illnesses, after a suicide attempt, many people are afraid to say anything to you or they do not know what to say, so they say and do nothing. That hurts and makes recovery more difficult for the person who is a suicide attempt survivor. Stigma rings loud after a suicide attempt, but maybe the ringing is louder because of my fear of other’s stigma that may or may not be present. It is fear of the unknown that is scaring me the most right now. I know in time I will gather enough strength to survive this and recover once again. Hopefully, I will become even stronger than I ever have been before, gaining a new knowledge and insight into life in a way I have not yet discovered. I know there is a reason for everything and that soon God will show me the reasons. One day, my understanding of my suicide attempt will become much clearer, maybe never crystal clear, but with God’s everlasting love and grace, my glass will sparkle and shine brightly. I had all these signs and more for many months, but I didn’t want help and thought I could keep fighting my suicidal ideations. I was very wrong. According to statistics, in the United States, someone dies by suicide every 13 minutes, and each death intimately affects at least six others, according to the American Association of Suicidology. Between 1989 and 2013, there were 825,832 suicides, leaving an estimated 4.95 million survivors behind, the AAS says. If you are having suicidal thoughts, please get help right away and do not make the same mistakes I did. Thank you. 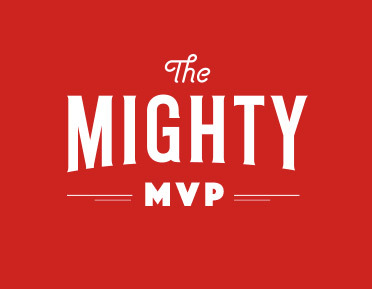 Reach out, connect, inspire hope, and offer help.